This is a scalable context timeline. It contains events related to the event May 1, 2009: Prosecutors Drop Charges against Lobbyists Accused of Passing Classified Information. You can narrow or broaden the context of this timeline by adjusting the zoom level. The lower the scale, the more relevant the items on average will be, while the higher the scale, the less relevant the items, on average, will be. National Security Adviser Rice, upset with a media leak, orders an investigation that will uncover evidence of widespread Israeli spying in the US. 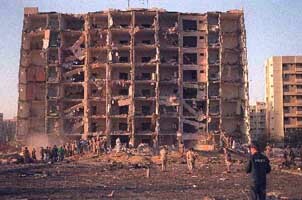 The Saudis had recently threatened to end their close alliance with the US (see August 27, 2001 and August 29-September 6, 2001), and on September 6, 2001, President Bush held a meeting attended by Rice and others to work on how to appease Saudi concerns (see September 6, 2001). Just three days after the meeting, there is a story by Jane Perlez in the New York Times accurately detailing what was discussed in the meeting. It will later be reported that Rice is furious about the leak to Perlez and immediately demands a clampdown on leakers. The determination to improve secrecy increases in the wake of the 9/11 attacks. This leak investigation focuses on Israelis in the US. No one is ever prosecuted for the leak to Perlez, but the investigation will takes on a life of its own and continue for years. 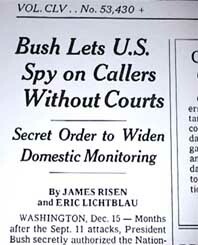 [New York Times, 9/9/2001; JTA (Jewish Telegraphic Agency, 5/17/2005; Nation, 7/14/2005] It appears the FBI had been investigating Israeli spying in the US since at least 1999 (see April 13, 1999-2004), and there are reports of a discovery of a “massive” Israeli spy operation in the US in 2001 (see 2001) and/or the discovery of the Israeli art student spy ring (see March 23, 2001 and June 2001). It is unclear if there is any connection between these investigations and this media link investigation or not. Two lobbyists for the American Israel Public Affairs Committee (AIPAC), Steven Rosen and Keith Weissman, are indicted for crimes relating to their role in passing classified US government information to Israel (see April 13, 1999-2004). They are charged with conspiring “to communicate national defense information [to] persons not entitled to receive it,” applicable under the Espionage Act. Their charges are similar to those filed against former government employee Larry Franklin, their contact (see October 5, 2005). National security expert Eli Lake will call the charges against Rosen and Weissman “unprecedented,” noting that for them to face the same charges as Franklin puts them—two private citizens—under the same obligation as Franklin, a government official, to keep secret any classified information they might acquire. Lake will write: “[I]f it’s illegal for Rosen and Weissman to seek and receive ‘classified information,’ then many investigative journalists are also criminals—not to mention former government officials who write for scholarly journals or the scores of men and women who petition the federal government on defense and foreign policy. In fact, the leaking of classified information is routine in Washington, where such data is traded as a kind of currency. And, while most administrations have tried to crack down on leaks, they have almost always shied away from going after those who receive them—until now. At a time when a growing amount of information is being classified, the prosecution of Rosen and Weissman threatens to have a chilling effect—not on the ability of foreign agents to influence US policy, but on the ability of the American public to understand it.” [US v. Franklin, Rosen, and Weissman Criminal No. 1:05CR225, 8/4/2005 ; New Republic, 10/10/2005; Savage, 2007, pp. 174] Months later, Attorney General Alberto Gonzales will say that journalists and other private citizens can be prosecuted for leaking classified information (see May 21, 2006). Almost four years later, the charges against Rosen and Weissman will be dropped (see May 1, 2009).